Eggs are synonymous to Easter. The mere mention of Easter would bring to mind eggs, chocolate eggs in particular. Easter bunnies and eggs are surely the product of a commercial ploy, much like Christmas and Valentine's Day. I must admit that it won't be fun without them. For the Christians, Easter has a deeper and more somber meaning. Eggs still play a part but it symbolizes rebirth or resurrection. For foodies, Easter means feasting and eggs in many forms, among other things, are usually present. 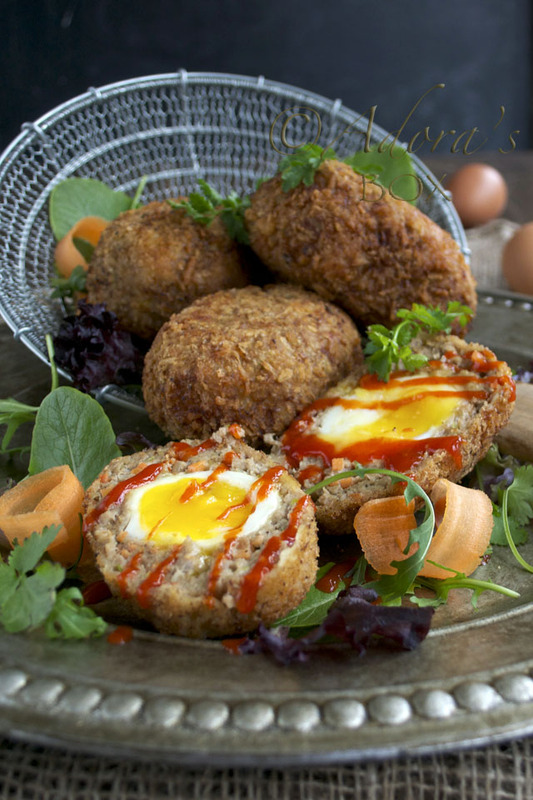 Scotch eggs, although has roots in England, has universal appeal. It is similar to the Indian Nargisi kofta, the Dutch eierbal, Brazilian bolovo and to meatloaf stuffed with eggs. I take my inspiration on something my Mum used to buy from a Chinese shop and it was called moon balls. 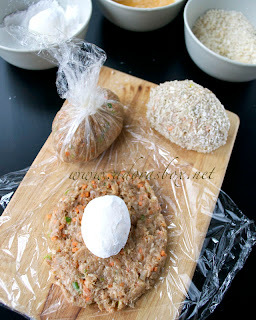 The meat encasing the eggs is pork mince mixed with Asian savoury seasonings, carrots, garlic, onions, and spring onions. The distinct seasoning is five spice powder. It is a mix of star anise, cloves, cinnamon, Szechuan peppercorn and fennel seeds. It is quite heady and is only used in tempered amounts to give a hint of its flavour, which is all that is needed. Served with sriracha, chilli oil or even sweet and sour sauce (recipe here), it is a very satisfying addition to the dinner or snack table. Put the garlic and onions in a small microwaveable bowl. Add in the 2 tsps. of oil and stir. Microwave on full power, covered, for 2 minutes. Leave to cool. 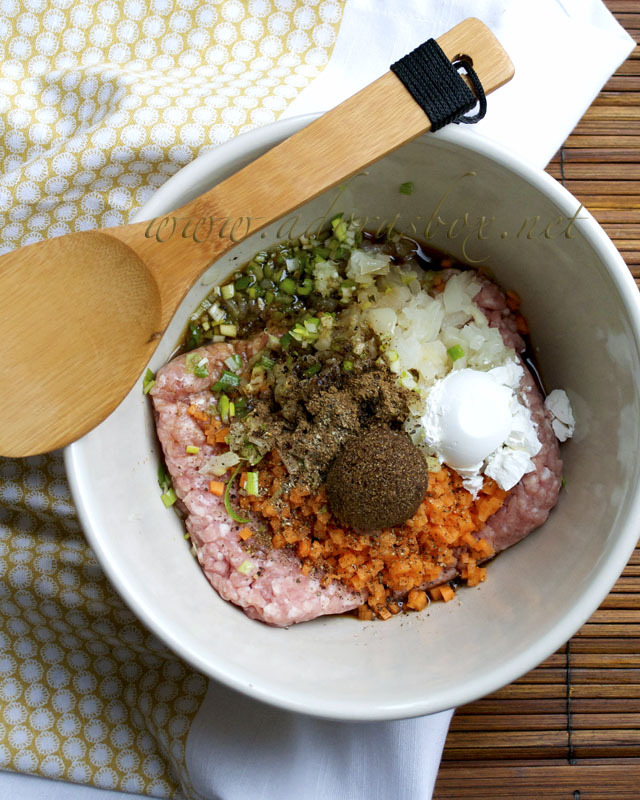 Put the pork in a mixing bowl and add in the chopped carrots, spring onions, soy sauce, sherry, brown sugar, salt, five spice powder, black pepper and corn flour. Add in the cooled garlic and onion mixture and mix thoroughly until pasty. Set aside for at least 20 minutes to let the flavours develop. Boil water in a pot that's big enough to hold the eggs. Put the eggs into the boiling water, carefully letting it touch the bottom of the pan before letting go. Simmer on low heat for 7 minutes for soft set yolks, 9 minutes for hard boiled. Prepare a bowl of iced water. When the eggs are done, transfer to the the bowl of iced water. Leave to cool. Peel. Divide the pork mixture into four portions. Put one portion into a square of cling film and pat into a flat oval shape. Dredge an egg in the corn flour. Set it in the middle of the meat mixture. Gather the four corners of the cling film to enclose the egg. Twist to seal. Take out of the cling film and dredge in corn flour, dip in egg then coat with the breadcrumbs. Coax into an egg shape. Do the same with the rest of the eggs and pork mixture. Heat up a frying pan and pour in enough oil for deep frying. When hot, carefully put in two of the eggs. Fry for about ten minutes turning frequently to keep its rounded shape. It is done when well browned, crisped and cooked through. Serve hot. 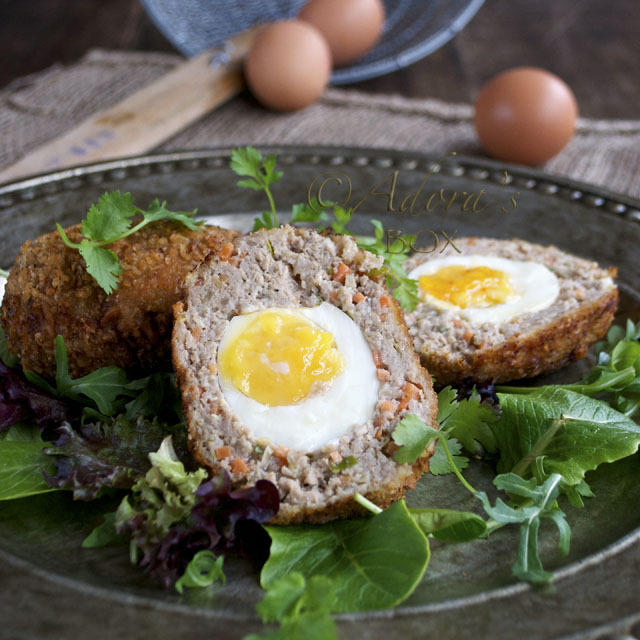 Easter is drawing near and you made this special Scotch Eggs to bring out the festive mood! An egg in a mince meat egg shape ~ how stunning it look as in presentation too. 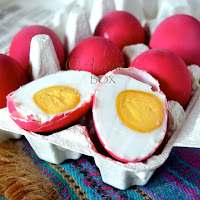 Adora, these eggs are so adorable. Happy Easter day!!!! 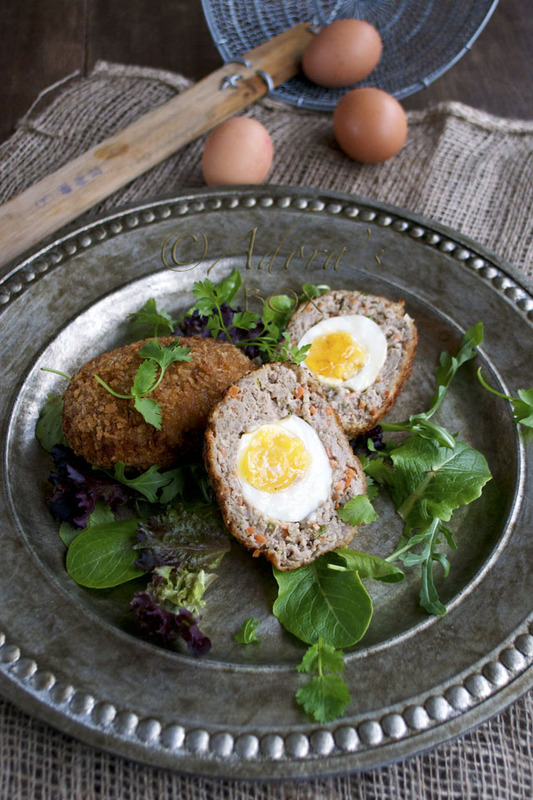 Your Scotch eggs look really good. I am planning to try making some next mth :) Happy Easter! Hi Yen. Happy Easter! You can use your leftover easter eggs for this, right? Hi Adora! You changed your font? Hi Alvin. Changed the font by accident and silly me couldn't figure out how to change it back. Did it in the end. This is one of those dishes that I've always wanted to taste. 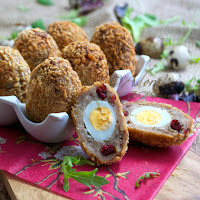 I've never had a Scotch egg and I find them quite intriguing with the egg in the middle. Thanks for putting together such great instructions and a tasty looking recipe. I might just have to give these a try. Your pictures definitely make me want to eat one! Hi MJ. 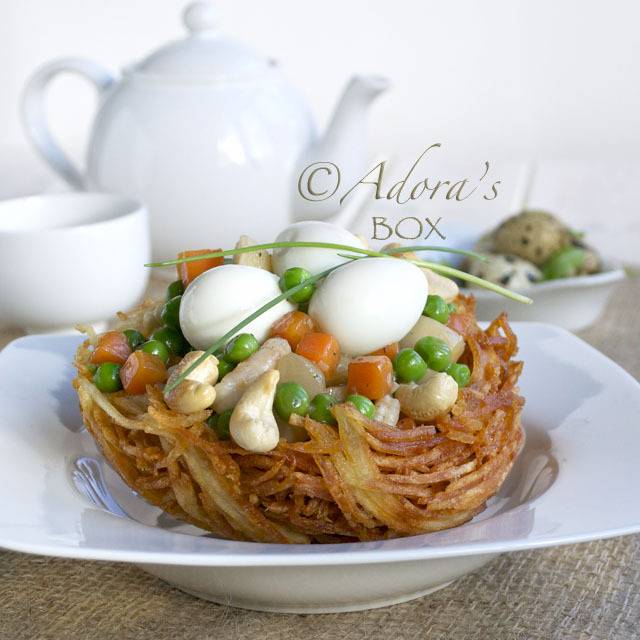 They call these picnic eggs because they bring it to picnics. You can season it with anything you like. 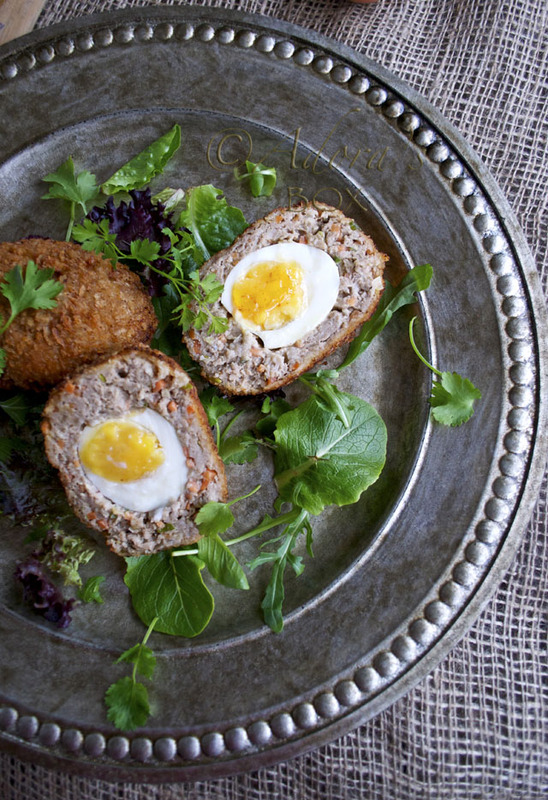 These scotch eggs look so elegant. I definitely want to try them sometime soon! Wow! Sarap! Definitely trying these. Thanks for sharing such a delish recipe. My family will enjoy these Asian Scotch eggs!